While the pasta is cooking, heat the olive in a large skillet over medium high heat. Add quartered mushrooms and sauté, stirring frequently, until just slightly tender. Add marjoram and scallions to the skillet and cook, stirring for about 1 minute. 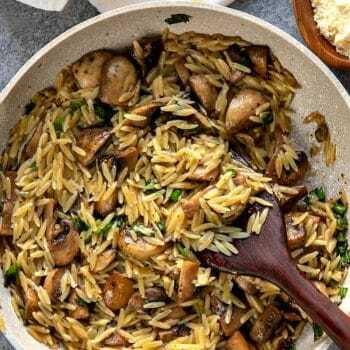 Drain the orzo in a colander that has been placed in a large bowl – you want to collect any remaining chicken stock leftover from the cooking process to use for the sauce. Add the cooked orzo to the skillet with the mushroom mixture, along with 1/4 to 1/3 cup of the reserved chicken stock from cooking the pasta. Over medium high heat, simmer until most of the liquid is evaporated. Remove from heat. Season with salt and grated parmesan – toss to combine and serve immediately.